Monies raised at our recent charity day held at Bungay Football Club by Tubes Scaffolding Ltd. and Cornerstone Ltd. has helped a Norwich School. 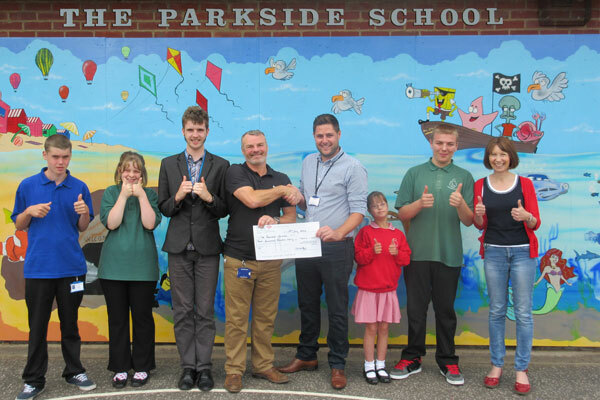 The Children of Parkside School, Norwich pictured with Robert Fleck (centre) receiving a cheque for £1054.13p from Robert Long of Tubes Scaffolding (left) and Mark Downton of Cornerstone (right). The money raised will go towards new projects at the school which include a sensory room and new classrooms.The total raised was £2,108.26p which has been divided between Parkside School and Macmillan Cancer Support. Parkside School exists to help youngsters from 4-16 years of age balance the requirements to maintain a stable and developing environment within school and meet the needs of the pupils who, for whatever reason, are not able to continue within mainstream education. The school specialises in the education of children with language and communication difficulties and has staff dedicated to this area. Since September 2008, Parkside School has been awarded specialist status in Communication and Interaction.